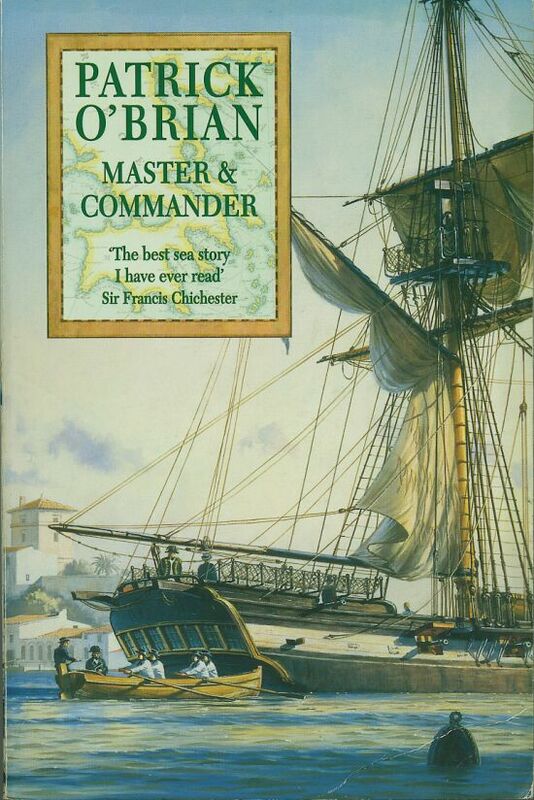 The Geoff Hunt cover illustration for M&C shows a Mediterranean harbor scene, probably Port Mahon in Minorca. I believe it to be a late spring or early summer morning, around 7 bells in the morning watch. 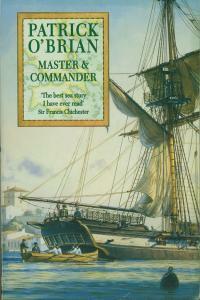 The British brig-sloop is presumably the Sophie, with Jack Aubrey pacing the quarterdeck in his Commander's dress uniform, single epaulette on the left shoulder, and hat worn athwartships. The Sophie is either at anchor or moored to a buoy such as the one shown in the foreground. With the light breeze coming from aft, it is curious that the ship is not being swung about to point into the wind; perhaps there are unseen lines mooring it both fore and aft. Only the main mast is visible. Among the sails, most prominent is the fore and aft main sail, bent to the gaff and boom. If the Sophie were a three masted ship, this sail might be called the spanker. The main yard carries a tightly furled square main sail. One or the other might be used depending on the wind direction, but rarely both at the same time. The square main sail was a bit of an innovation in 1800; in earlier years brigs did not generally carry one. The next yard up is the main topsail yard, lowered down onto the cap. The topsail is parly unfurled, with the lower corners 'clewed up'. At the very top of the picture is a hint of the topgallant yard, also lowered onto its cap. On both the main and topsail yard, there are extendable booms for the stunsails. Of the rigging, the darker lines are standing rigging, fixed tarred support lines. The lighter brown lines are running rigging, meant to be be hauled upon to move the yards and adjust the sails. Two of the Sophie's 4-lbers are visible through open gunports in the waist. A third is visible on the quarterdeck. Other small rectangular openings in the hull are scuttle ports for ventilation and pumping out water. Jack's cabin is a bit lower than the main deck, too close to the water line to allow for any gunports. The ensign that is flying from the peak of the gaff is the proper flag for 1800, the year before the union with Ireland added the cross of St Patrick. But Geoff Hunt might have nodded when he chose to paint the blue ensign; Adm Keith was VAdm of the White in 1800. A four-oared jolly boat or yawl is being rowed past, carrying a lieutenant in his undress uniform, hat worn fore and aft in the modern style. Could this be Lt. Dillon, returning to the Sophie? If so, one might expect him to be facing the other way, observing the ship and clear of the side that will come alongside the entry port. The boat's crew is very nicely turned out with matching outfits and black kerchiefs around their necks. Perhaps they are just rowing past on their way to some crack frigate.